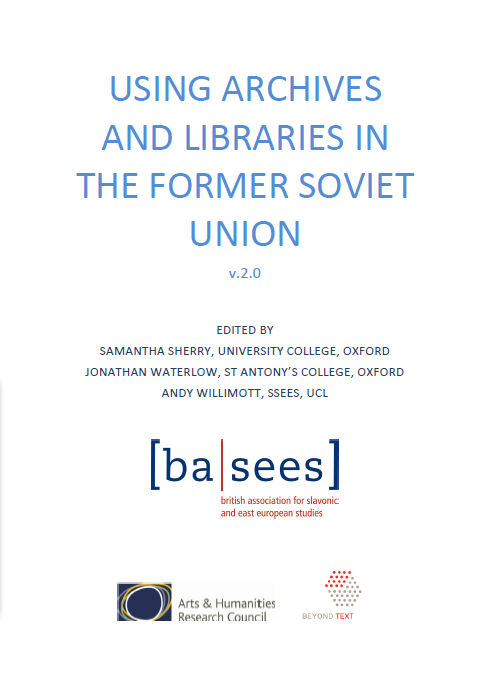 This guide contains essential information on some of the main archives and specialist library collections in the former Soviet Union. The information is correct as of 2013 for many of the institutions listed (other entries were correct as of 2010), and has been compiled by researchers who have recently worked in these institutions. However, the reader should bear in mind that procedures and opening hours can change with little notice or anything approaching logic. Contributions, including research articles, book and film reviews, and review articles are welcome from all research students and academics. Submissions to the Board of Editors may be sent via e-mail attachment or on disk in Microsoft Word format (version 6.0 or lower). In addition to such electronic media submissions, we ask that contributors submit two hard copies of all articles and reviews, and a 100-word abstract for all articles. Contributors must adhere to the style sheet which can be found on the website. All manuscripts are refereed and undergo a review process. Contributions submitted must not be under consideration by other publications at the time of submission. The editors reserve the right to make any changes thought to be necessary or appropriate to typescripts accepted for publication. A duplicate should be retained by the author. No disks or hard copies shall be returned. The length for consideration of an article is 6,000 to 8,000 words (including footnotes), and 600 to 700 words for a review. If you have any queries about becoming a contributor for Slovo please do not hesitate to get in touch with us and we will be happy to assist.